- Complete medical and feeding/eating history background. - Full assessment, including observation of a meal or snack and trials of therapy techniques. *BILINGUAL EVALUATIONS available upon request. - Evaluation report provided to the family within a week. - Provide evaluations to primary care doctors and schools as needed. - Evaluations are completed in the clinic setting. Go to FORMS page to complete evaluation and feeding questionnaires and intake form prior to first appointment. - Evaluation is usually completed within an hour, as long as forms are filled out in advance. - Evaluations can be completed on all children, as early as newborn. - Depending on evaluation results a home program and recommendations will be provided. - Providing treatment for children with diagnoses of dysphagia and/or sensory feeding difficulties. - Sessions will be 45-60 minutes in length. - All treatment sessions are done in the clinic around meal or snack times. - Vital Stim and S.O.S (Sequential Oral Sensory) Approach to Feeding therapy techniques are available. - Treatment meals will be provided by the family, however diet resources will be provided by Eat, Talk & Play Therapy LLC as needed. - All treatment includes a home program with resources. 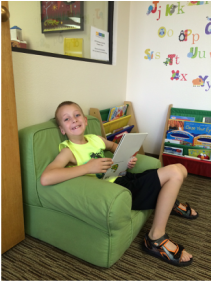 CHECK OUT TESTIMONIALS FROM PARENTS AND CLINICIANS! - VitalStim is a specific tool used to help children with dysphagia train their swallowing muscles to swallow more effectively and efficiently. - VitalStim is the only NMES (neuromuscular electrical stimulation) treatment FDA approved to work on muscles of neck and face. - Therapy will include electrodes, meal modifications, and use of device during treatment. - Complete medical, speech and language history background. - Full assessment, including standardized assessment and clinical observation. - BILINGUAL EVALUATIONS available upon request. - Evaluations are completed in the clinic setting. Go to FORMS page to complete evaluation questionnaire and patient intake form prior to first appointment. - Provide intervention and treatment for children with various diagnoses including: Articulation/phonological disorders, Apraxia, Expressive/Receptive Language Disorder, Speech/Language Delay (Late talker), Autism, Stuttering, Down Syndrome, Cerebral Palsy, Epilepsy, Developmental Delay, and other various genetic disorders. - Sessions will be provided in a 1:1 setting. - All sessions are completed in the clinic setting. - All treatment sessions include a home program with resources. - Experience and exposure to working with the following devices: TouchChat, GoTalkNow, Dynavox, and Prentke Romich devices. - Collaborate with local agencies regarding to determine which device and switches best fit the child's needs. - Provide 1:1 training and/or therapy with child and/or family and child. - Implement use of AAC device into speech/language therapy sessions. - Provide resources to family regarding various devices, switches, apps, etc.